Just a tiny spec in the ocean, Norfolk Island is a whole country contained in just 35 square kilometres. Midway between New Zealand and New Caledonia, Norfolk Island has two mountians over 300m tall and the majority of land is suitable for farming. Norfolk has 80 km of lanes and tracks, weaving along cliffs and beaches, around crumbling ruins and scented pine tress. Left behind from a basaltic volcano much of the coastline is cliffs but there are a few beaches good for swimming and surfing. 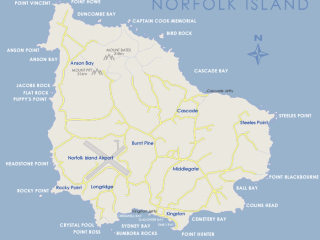 This detailed Norfolk Island map shows the entire Island including the various beaches and the town centre at Burnt Pine. The map clearly shows the airport, the beautiful Emily Bay and the 2 tall mountains Mount Pitt and Mount Bates. 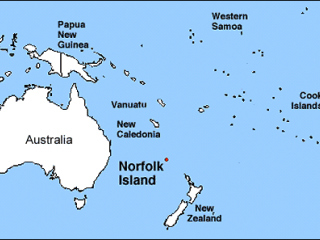 This location map shows Norfolk Island's general position in the South Pacific Ocean. See the distances between New Zealand, New Caledonia and Australia. 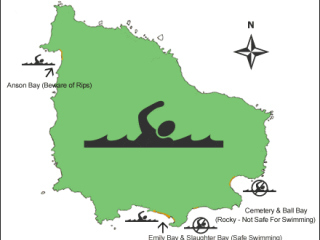 This map shows Norfolk Island's beaches and safe places to swim.